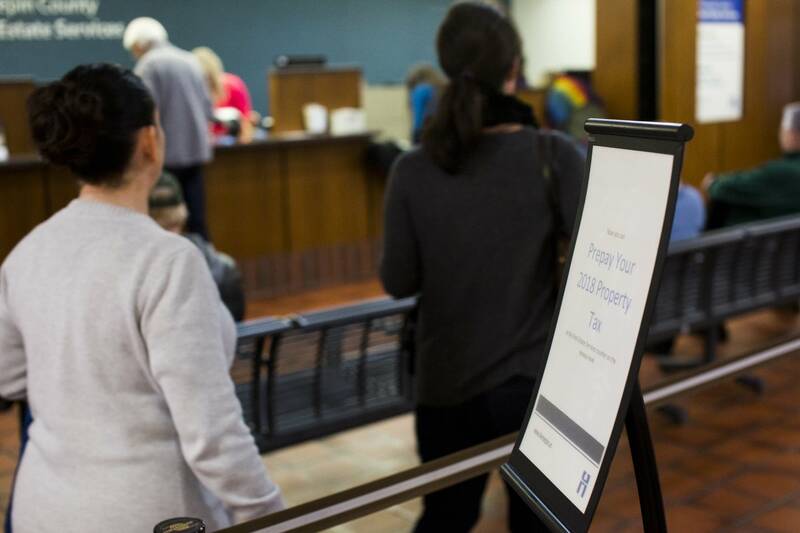 Some 60,000 taxpayers prepaid this year's property taxes last year according to a Minnesota Public Radio survey of county tax officials. They said the prepayments amounted to a whopping $350 million in total. The goal was to lock in a federal income tax deduction that Congress largely eliminated in the new tax law. Billy Collins of St. Paul was among the folks who got in long lines late last year to pay this year's property taxes. He was sure the move would pay off by reducing last year's tax bill. "I talked to my accountant and he told me to go ahead and do it," Collins said. Taxpayers rushed to make advance payments in many states, especially those with relatively high state and local taxes, such as New York and New Jersey. The IRS guidance for Minnesota taxpayers has been cryptic at best. That's left tax preparers and taxpayers trying to define if early tax payments are indeed deductible. Some tax professionals punted and left the deduction decision up to the client. Some said they were confident the deductions would not be permissible. But more accountants figured the early payment would be deductible. "At the time of the decision, the camp that was it deductible I think was significantly bigger than the camp that said that it was not deductible," said Geno Fragnito, government relations director for the Minnesota Society of Certified Public Accountants. And he said that's still the case. The Minnesota Revenue Department asked the IRS months ago for a simple yes or no answer. "Still no response from the IRS," said Revenue Department assistant commissioner Cynthia Rowley. Given the uncertainty, Christopher Wittich was among the accountants who chose not to take a position on the issue, and let the client decide what to do. "We just explained that some people think the two years is deductible. Some people do not. It's a gray area, for sure," he said. "And in those cases we're not going to tell clients you have to do it one way or the other." Wittich thinks it could be years before taxpayers find out if the IRS will accept the deductions. Individuals may not know until the IRS reviews their returns and makes a decision. "It takes quite a while. I mean it probably is going to take a year, year and a half, two years before they really get to start auditing those returns," Wittich said. And even though many taxpayers may be waiting for their own personal outcome, there is some certainty for some taxpayers. The Minnesota Department of Revenue says that property tax prepayments will not backfire for residents eligible for annual property tax refunds. Homeowners with a total household income of less than $110,650 in 2017 are eligible. Last year, the average refund was $892. And some taxpayers already know they've been denied the deduction. That's because they were subject to the alternative minimum tax, which prevents wealthy taxpayers from using loopholes and some tax breaks to slash their tax bill. "Surprisingly, most of my clients that prepaid, it ended up being a moot issue because they fell into the AMT calculation anyway," said White Bear Lake CPA Elizabeth Bystrom. "So, they would not have been allowed to deduct their property taxes." For the rest there's now a new level of uncertainty. Four states — New York, Connecticut, Maryland and New Jersey — sued the federal government this week to void the new $10,000 cap on deductions for state and local taxes that are at the heart of the discussion. The states contend the limit on deductions will depress home prices, job creation and impair the states' funding for public education and services. So, now taxpayers get to wait for both the IRS and the courts to weigh in.